Guide , Philip, adds yet another language to the portfolio on offer for international groups at Abbotsford. 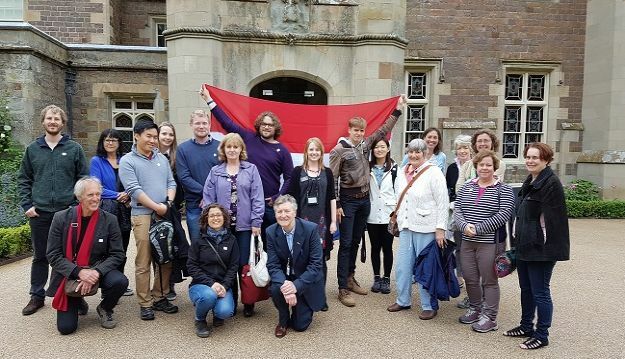 Abbotsford, home of the internationally renowned nineteenth-century author Sir Walter Scott has successfully piloted a new Dutch guided tour for groups in conjunction with the University of Edinburgh. Earlier this month, a group of students learning Dutch at the University visited Abbotsford. The students were accompanied by native-speaking Dutch friends and their Tutor, Claire Van Wengen. They were treated to a tour by Abbotsford volunteer guide of four years, Philip Robertson, also a fellow classmate studying the language at the university. Philip, who also speaks French and Spanish fluently, was able to deliver a 45 minute introduction to the house and gardens in Dutch for the very first time after beginning to learn the language at evening classes in the autumn of 2015. The tutor of the group, Claire Van Wengen has also supported Abbotsford in the production of a Dutch transcript to help satisfy the growing demand for written material in the language. The Abbotsford Trust believes that, with the excellent ferry links from Belgium and The Netherlands, the Dutch-speaking market has increasing potential for Scott’s Scottish Borders home, with numbers of Dutch visitors to the attraction continuing to rise. Philip’s dedication as a Volunteer Guide is but one of the ways that the team at Abbotsford work, tirelessly to deliver a quality, award winning visitor experience in honour of the Great Scott. Other languages available at Abbotsford which enhance its reputation as a top tourist destination are: French, German and Spanish with transcripts in German, Russian, French and Chinese for our Visitor Centre Exhibition.